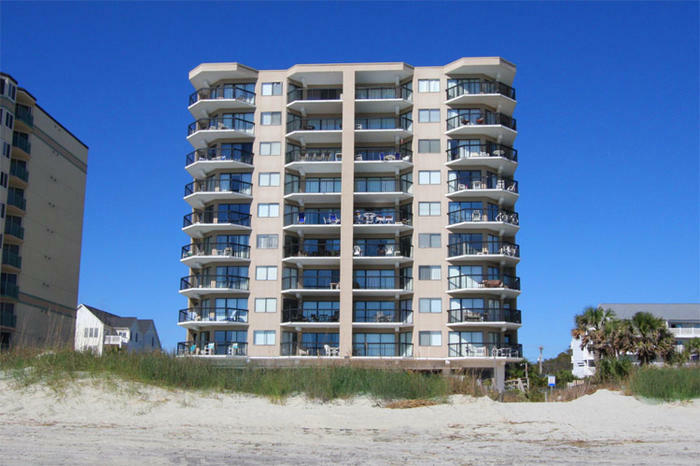 Furthermore, your family might opt to watch a movie on the DVD player during your North Myrtle Beach vacation at Crescent Towers II. Having the option to snuggle in during the evening hours one night of your beach vacation and watch a family-friendly movie might be enticing, especially if the other nights of your North Myrtle Beach vacation have been jam-packed with North Myrtle Beach amusements and attractions. Crescent Towers II is a charming oceanfront North Myrtle Beach resort that is located in the Crescent Beach section of North Myrtle Beach, South Carolina. It is a North Myrtle Beach resort that is at the end of 25th Avenue South. Easy to find, this North Myrtle Beach resort is just six blocks from Highway 17, the road that leads to all the terrific North Myrtle Beach amusements. In close proximity to this part of town you will find several fishing piers, beach clubs, shopping, dining and live entertainment theatres. There are also water sports nearby. The Cherry Grove Fishing Pier is famous for some record catches and your family will likely enjoy walking from end of the fishing pier to the other and seeing the Atlantic Ocean and the fish being reeled in by experienced fishermen. Beach clubs are scattered around the Ocean Drive part of North Myrtle Beach, SC and are great places to hit the dance floor with your best shag dance moves. Shopping and dining are both found at the nearby Barefoot Landing, which is situated along the Intracoastal Waterway and developed around a freshwater lake. This is also where you will find Alabama Theatre and the popular concert venue, House of Blues. Additional shopping is not hard to find in North Myrtle Beach. There are outlet malls, boutique shops, Bass Pro Shops at the Myrtle Beach Mall and antique stores throughout the Myrtle Beach area. Visit Broadway at the Beach for more shops and more dining and more entertainment. These one-stop destinations make it easy on families where each person has different interests. The live entertainment theatres in the Myrtle Beach area include those that feature spectacular resident shows, touring Broadway productions, celebrity tribute concerts and dinner theatres. Alabama Theatre and Carolina Opry have terrific musical productions that are most definitely family friendly. Pirates Voyage and Medieval Times are dinner theatres where you are served a delicious feast during the course of the live show. The Palace Theatre has a varied calendar of events, as does House of Blues. And Legends in Concert is just that, legends…in concert. Now for water sports you need not look far. Sea Doos zip atop the ocean waves. Banana boats filled with one whole family bounce along behind a jet ski. Parasailing is available and in some places around town you may soar two people at one time. There is much to do in the North Myrtle Beach area, in addition to more than 100 golf courses!